All freedoms have to be better! See the joint appeal of 16 public organizations to the prime minister on http://bit.ly/1PXfmm1. The document is about the inadmissibility of blocking websites without a special permission on a legislative basis. Share it, support us! 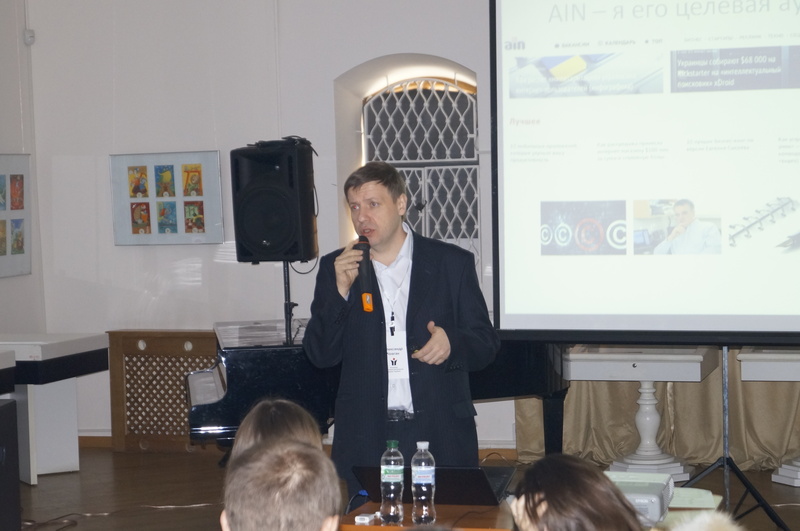 The RIA fund finances lawyers and special representatives of Associations for interaction with Parliament in Kyiv. 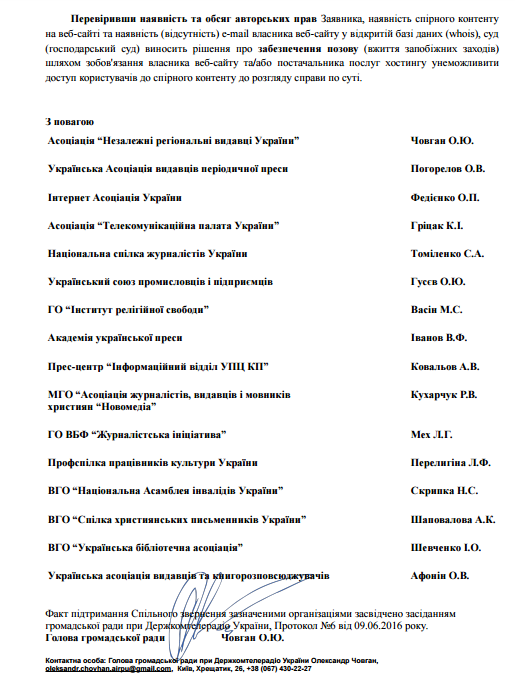 The Cabinet of Ministers of Ukraine submitted to the Verkhovna Rada the draft law “On amendments to some legislative acts of Ukraine on protection of copyright and related rights in the Internet” (Reg. № 4629 of 10.05.2016). The bill as it is noted by its authors, in particular, is aimed at introduction of the transparent, predictable and effective mechanism of the termination of violations of author’s and (or) allied rights by removal or prevention of access to the information, violating copyright and (or) allied rights on the Internet. Certainly welcoming the actions, directed on fighting against piracy, we note that the bill has essential shortcomings, which can lead to negative consequences, in particular to human rights violation on the Internet, and damage to the activity of the subjects of managing. Any person (including unfair firm – “something ephemeral”), having received a digital signature, can submit for the owner of the website some unreasonable application with the requirement of removal of information or a ban of access to it. In this case, it will be enough for the applicant to “claim” the existence of property rights to the copyright object without providing any proofs.” The result of this application may be blocking (deletion) certain information, and, in the case of filing the application to the hosting provider – blocking the entire website because a hoster (an owner of the site), when using a https-protocol (such as 50% of sites), can not block content, but the entire site. 2. The service provider of a hosting will block any foreign website without a court order. 3. The above mentioned block, according to the bill, will last at least 10 days. Subsequently (no later than 14 working days of sending a copy of the application), an unfair applicant may file a claim in court, providing documents on a hosting service provider, and use certain procedural actions to delay the proceedings. 4. Also, the bill does not establish obligation of the applicant to apply to the court for a final decision, but only assumes unlocking the content (website) not later than 14 days from the moment of filing of application in case of failure to provide to the owner of the website, (service provider of a hosting) of documents, which confirm that the subject of copyright and (or) allied rights, initiated judicial proceedings for the purpose of ensuring protection of the copyright and (or) allied rights. But at the same time, the bill does not eliminate the possibility of the applicant to address repeatedly with the requirement about removal or impossibility of access to information without limiting the number of appeals that can actually lead to long blocking. 5. 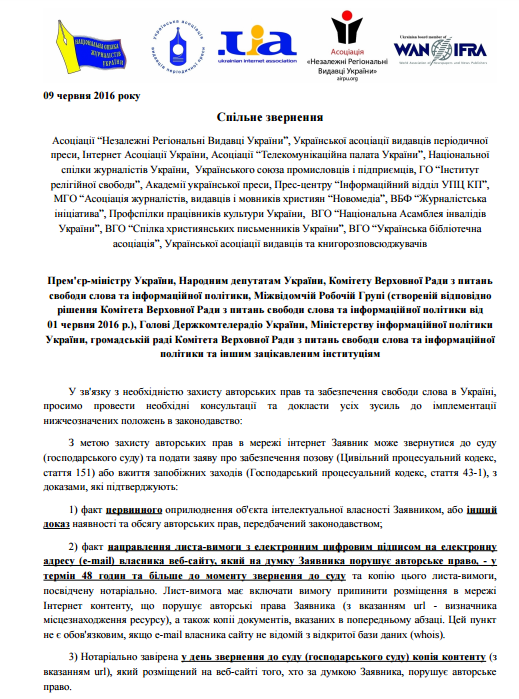 The changes, proposed in paragraph 3 of draft amendments to the Law of Ukraine “About copyright and allied rights”, will provide any person (including competitors in business and political spheres) with a tool for provocations and abuses, will create conditions for chaos and a collapse in the sphere of the Internet, and will lead to enormous tension in society, and discontent with the activity of the power as it already took place with the bill SOPA (Stop Online Piracy Act); will significantly reduce the ratings of Ukraine on freedom of speech and other freedoms. Fixing the principle of “presumption of guilt” of any user and the inability to quickly restore access to content, that has been illegally restricted, also creates a serious threat to the work of journalists and civic activists, highlighting the issue of corruption and other abuses in the public sphere.